I got a box of rocks from my parents today. In their defense, I asked them for it. 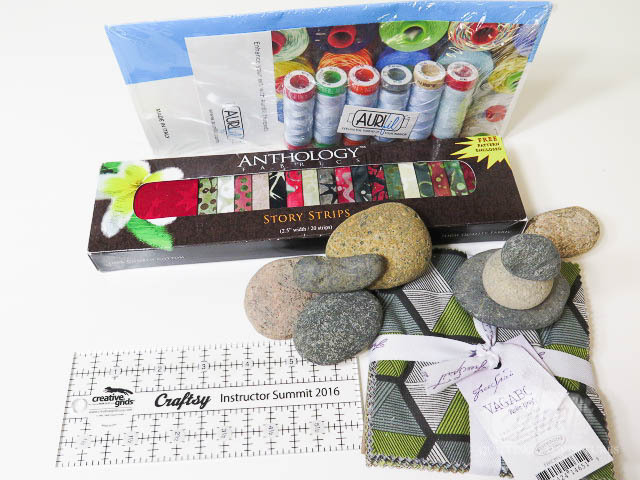 In fact it was a box with rocks and all of my goodies from the Craftsy Instructor Summit. I didn't have room in my suitcase for all of it. There were sponsor booths with some great freebies for the instructors. This kind of thing makes me giddy and anxious at the same time. Clearly they are there to work with Craftsy peeps. (There's not a big enough group of us fabriholics to justify the idea of selling to us.) But to say, "Can I have some of that, please?" is an awkward thing for me. I don't like having any strings attached to freebies and will speak my mind about the good and bad of any product as I see it. I think most of you can see that in my reviews. Now, if they say, "Here, take this." I'll take it. Craftsy gave us a bag full of little goodies at registration, which is where most of these things came from. 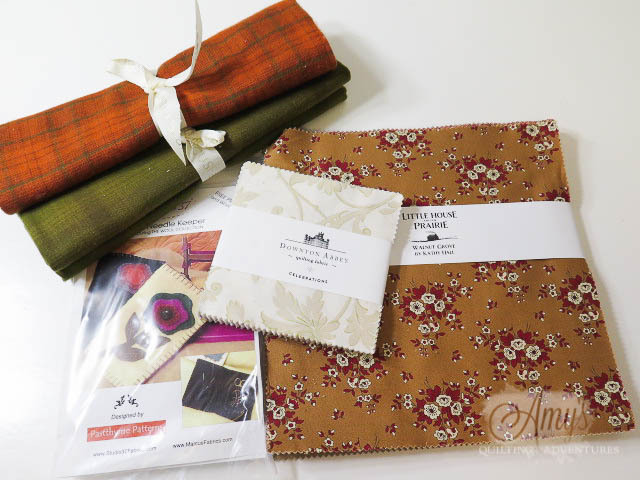 I was tickled to get quite a few solid fabrics since they're pretty easy for me to use as samples for free motion quilting. 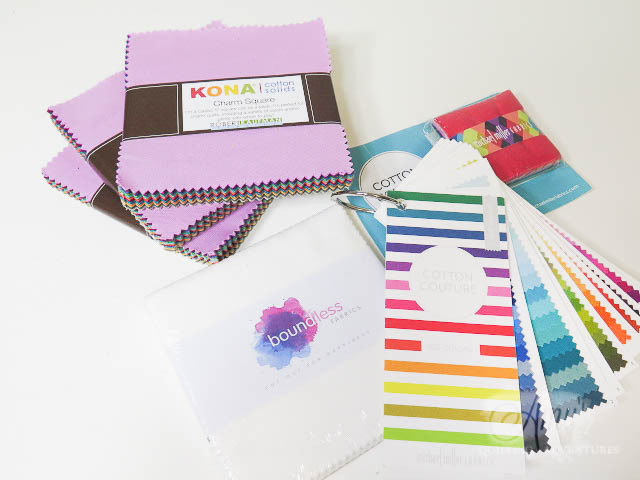 I like Kona of course, but the Cotton Couture feels really, really nice. Almost like a sateen. I bet it'll show of the texture of quilting quite well. I haven't opened that pack of white from Boundless Fabrics, but charm squares of all one solid color? That's handy! Here's why I wanted that box of rocks! I've seen some beautiful painted, Zentangled, and even crocheted rocks on the web and I wanted to do some of my own. I think I need more practice. 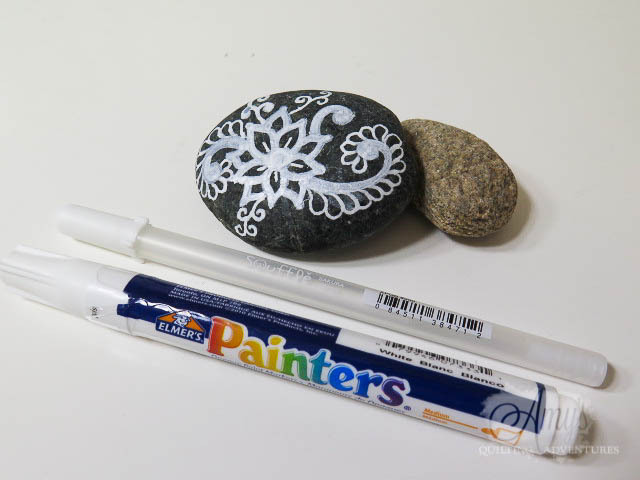 I did find that the Sakura Souffle pen worked better on the rock than the paint pen. Virginia doesn't have many nearby places where I can get such nice river rocks. But my parents now live in Pueblo and there were plenty there where we went to walk. Thanks Mom! Now if only I could actually get around to some quilting! Life has gotten a bit crazy with several things that I want and need to do. The timing is awful, so I'm doing the best I can on several fronts. I hate being this busy, but these things are needful. If you read my newsletter, you'll know I didn't deliver on my idea of a reoccurring blog link party to share ruler work designs, projects, and progress. I'm still very excited about this, but I didn't get home due to flight delays until after the date I should have posted it. We'll do it instead the second Wednesday of February, so get your pieces ready to share. There are still a lot of folks who can't imagine holding a ruler and moving the quilt under the machine and I want to show them that not only is it possible, but that it's also easier than it sounds once you try it! YES! It is definitely easier with rulers than ti looks! Those grippy things on the back help a lot too. Love the box of rocks. :) Last move, someone was lugging a small very heavy box and said the same "What's in here - a box of rocks?" I looked and went "Yup. Hand painted with our names on them." Usually when we move something as heavy as a box of rocks here, it's books. But I so thankful that my parents sent them onto me. Whose line is the green, white, gray triangle? Ahhh....that's the charm pack I immediately though of as being very masculine. No surprise then that it was Vagabond by Parson Gray, the brand designed by Amy Butler's husband, David Butler. I painted rocks this past summer with my grandson. I first sprayed them with primer then let him go at them with acrylic paint (he is 4). It was very interesting to see what the shape of each rock looked like to him, one was a caterpillar and one was a frog and of course there is a lily pad. I finished them off with a good coat of satin gloss outdoor paint and they seem to be holding up nicely. I did outline and add some detail to his paintings which he loved and he supervised me. I love looking at them as they hold precious memories! A great activity for the kids, for sure!